We're delighted to be running Harry's lunch for the third year on Wednesday 22nd September 2010. 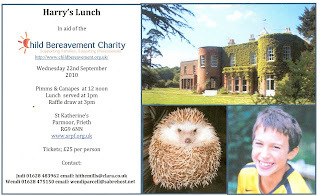 It will be held once again at St Katherines in Parmoor and the chosen charity this year is the Child Bereavement Trust. The menu will be a choice of Salmon with Pesto Crust, Chicken Provencale or the vegetarian option of Aubergine and Mozzarella Bake/ Towers. This will be served with seasonal vegetables and minted potatoes. This will be followed by a dessert of Chocolate Brownie with Cream or Meringue Hedgehogs with Fruit Couli. Tea and Coffee will then be served. Please could you advise us of your choice when booking your ticket. We do hope you can come along and bring your friends. It would be lovely to see you all again this year for this fun and sociable occasion and also to raise valuable funds for charity. As you know we do like a theme and this year is no different. It is to be Harvest time with the addition of hedgehogs! Tickets remain at the same price of £25.00. For tickets or more information please contact Judi 01628 483962 hithemills@clara.co.uk or Wendi on 01628 475150 wendiparcell@sabrehost.net. Thanking you for your continued support.